Karen’s flat-mate Nick is executed in a drive-by shooting right in front of her and her life is turned upside-down. Everything she thought she knew about him turns out to be a lie. She becomes a suspect in the police investigation and criminals think she knows where Nick has hidden a large sum of money. 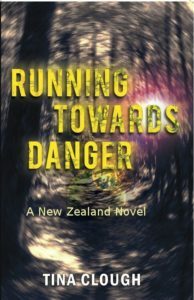 When her life is threatened she decides to leave Auckland and disappear. Karen becomes Cara and creates an anonymous existence in a small community in Hawke’s Bay, New Zealand. She changes her appearance, severs all links to her past and adopts a cash-based way of life that leaves no electronic traces. READ FREE SAMPLE BELOW THE PURCHASE DETAILS. I can stay no longer, he knows where I am. Whatever is about to happen I cannot bear to think that I will die cowering on the wet ground. I push off and leap up the slope, toes digging in for better grip, arms bent and pumping, slightly hunched in instinctive concealment mode. I run toward a cluster of dark trees further down the river bank in the direction that will take me away from the road and danger. The trees are a long way off but the only thing that offers possible shelter. I run so fast I can hear the water being sucked out of the wet ground as each foot lifts off. I reach the trees unharmed and stop, trying hard to suppress my panting breaths, lean against a tree trunk and try to blend in with its shape. Gradually my heart beat slows, my breathing becomes calmer and I move slowly away from the tree to look back to where I have come from. And as I stand there listening, searching the shades of grey and black for any sign of movement, arms grab me from behind. I slowly lower my foot to the ground and nod my head against the hand over my mouth, indicating that I will obey. Until that spring day I had never seen anyone die. I was walking home from the bus stop at a leisurely pace, enjoying the spring weather and planning a quiet evening watching a film on TV. I was only a hundred meters from my apartment building when I heard footsteps running behind me and someone called my name. I turned round and saw Nick about twenty meters behind me, out of breath and running hard. Then two shots rang out in close succession and Nick fell to the ground, in a sort of slow motion movement that left him lying, slightly skewed, at the edge of the sidewalk. I stood as if paralysed; for a moment my mind did not connect the sound of the shots and Nick falling to the ground, then realisation hit me and I ran towards him. He was badly hurt; his head was angled to one side and blood was pooling under his neck and shoulder. When I knelt beside him he lifted a trembling hand and his voice came out in a panting whisper. “Help me!” His eyes closed but his hand was still raised just above his chest, clenched and shaking. I was vaguely aware that a car had drawn up alongside us, but I did not look up. Then there was a burst of three rapid shots and I flinched with shocked surprise as Nick’s head seemed to disintegrate. My head snapped up and I just caught an impression of a dark car accelerating away; sound seemed muffled and muted. I looked down at Nick again and I knew that there was nothing I could do to help him now. The hand that had reached out towards me was now resting on the ground, as if tossed aside. I lifted the limp hand and put it on his chest; it was a shock that it felt so warm when I knew Nick was dead. There was a key on the sidewalk beside his legs and I picked it up as I rose and saw three people running towards me, one of them was shouting something but I could not hear the words. “I’ll do it.” He pulled out a mobile phone and I stood watching him without moving. The other two had reached us now; one of them was an older woman carrying a guitar. She looked at Nick and then at me and put the guitar case on the ground and pulled a tissue from her pocket. She took a step backwards but her eyes were still on Nick. The man bent down and covered Nick’s shattered head with the shawl and as he straightened up we heard the sound of sirens and I turned round towards the sound. A crowd had gathered without me noticing, some on our side and a bigger group on the other side of the street, staring across at us. And that was how it all started. Sudden and horrifying, but with no indication that it would soon change my entire life and make me do things that I would never have thought myself capable of until circumstances forced me to confront violence and danger. The other policeman lifted the shawl that covered Nick’s head. “Definitely dead,” he said and straightened up. He went to the car and we heard him talking over the police radio. Then he got out again and started moving everyone who had not been an eye witness away from the scene, telling the rest of us to stay where we were. We stood a slight distance from Nick’s body, a little clump of white-faced people, not talking or even looking at each other, just waiting. Within minutes the place was a hive of controlled chaos: more police officers, an ambulance, yellow ‘police incident’ tape, more calls on the police radio and more people. A van arrived with a PVC structure like a square tent that was immediately erected over Nick’s body. I stood there, watching with a kind of detached interest as the scene was quickly transformed into an organised and tidy operation by people who knew exactly what to do. A chubby man in plain clothes appeared in front of me, studying my face as if he thought I might suddenly faint or burst into tears. “I think I’d like to get home and get cleaned up. I live just a few doors down the street.” I knew from the way Benson’s eyes were roving over my face that I still had at least smears of blood on me. “His name is Nick Cheviot.” I gave him my details and turned to go, but he was not quite finished. I shook my head and said, “No thanks. I’ll be better on my own. At least for now.” I gave him the PIN code for the street door and he wrote it down in his notebook. As I walked the short distance to the entrance of the block of flats where I lived I was hoping that I would not meet any of my neighbours. I had lived there for two years and Nick had rented my spare bedroom for a year and a half. He had been the ideal flat-mate, because he was on the road for his job nearly every week and when he returned to town he spent very little time at home. A look in the hall mirror showed me a distressing reflection; there were streaks of smeared blood on one cheek and splatters in my hair and on my neck. Suddenly some primitive instinct gripped me and I knew that I could not bear having a dead person’s blood on me for one moment longer. If Benson turned up too soon he would just have to wait; the urge to shower was compulsive. I dropped my bag in the hall, tore my clothes off in the bathroom and stepped into the shower. I scrubbed my face and neck and shampooed my hair twice before finally turning the water off. As I stood there letting water run down my body a sudden brief fit of shivering travelled through me. I think I realised even then, at that very early stage, that I was more resilient than I had known. I was upset and shocked by what had happened, but I was not going to break down and cry or need someone to hold my hand and I was surprised by the discovery. Benson rang the door bell about five minutes after I had dried myself and got into clean clothes. He did not introduce the young uniformed man who was with him as I showed them into the living room. We sat down and the constable got a notepad out ready to take notes while Benson explained that it was important that I tried to be as accurate and descriptive as possible even if some details might seem unrelated or unimportant. Already at that stage I knew instinctively that I had to make it clear that I had no ‘relationship’ with Nick. I could tell that Benson had reservation about me, that I had been moved from ‘witness’ to ‘potentially involved’ when I told him that I knew Nick. Now it I wanted to put a distance between Nick and myself, to ensure that his murder was not seen to be part of my life in any way apart from by circumstance. “Did you have a relationship with him?” Benson was not letting go of the relationship angle and I suspected that to him it seemed unusual that a man and a woman could share a flat and not have some sort of involvement. Benson studied his finger nails for a moment and frowned; was he thinking or was he trying to put me on edge? Then he looked up and said: “But didn’t you think that it was a bit strange? That he might be using this place as a bolt hole?” He studied my face as he asked the question and I thought he was hoping to catch some unguarded reaction. I hesitated for a moment, not sure if I was being a bit over-the-top detail conscious. I thought for a moment and then I said “bang, bang, bang” very fast. But even as I said it I knew it was not fast enough. “No sorry, that’s far too slow – it was more like this I think, nearly one continuous noise.” And I did it again much faster: “bangbangbang”. The constable was sent down to the car to get whatever they needed to seal the door and while he was gone Benson and I stood in silence until a thought struck me. Together we lifted the table out from Nick’s room and pushed it up against the wall under the mirror in the little hall. Bart returned and Benson and I watched him seal the door and then they left. It was half past seven now and once I was alone I felt restless and unsettled. I rang my friend Lorraine and talked to her for half an hour with a glass of wine in one hand and a sandwich on a plate beside me. Lorraine is a couple of years younger than I am and just qualified as a lawyer after working and studying alternate years to pay her way through law school. She’s very funny and smart and her partner is a middle-aged police officer, so talking to her was very enlightening. She told me some things that might happen during the next stage of the investigation and made sure I knew what my rights were. Settling down to watch the film now would have been impossible so when we finished the phone call I wandered round the flat trying to think of something to do. I went into the hall and looked at the seal on Nick’s door and tried to imagine what they might find in there and when I turned around I noticed that the table was round the wrong way with the drawers facing the wall. It was an old-fashioned hall table, long and narrow and quite high, with two wide drawers side by side; I had stripped it back and oiled it after I bought it and I was pleased to have it back in the hall. Now I dragged it out from the wall and swung it round before pushing it back in and thought that it must have had the drawers facing the wall in Nick’s room too, or Benson would surely have checked them before letting me have it back. I pulled out one drawer and to my surprise it was full of bank statements. I pulled out the other one and that too was full. I was surprised that Nick had so many bank statements; it looked like several years’ worth and not what I would have expected from someone his age in the era of online banking. Either Benson or Nick’s family should have these, so I fetched a carton and started taking untidy bunches of papers out of the drawers, straightening the edges and glancing at them as I worked. And then I noticed that there were bank statements from several different banks, so I flicked through them again and became increasingly puzzled. They were for half a dozen different people and only one account was in Nick’s name, though they were all were addressed to the same Post Office box. Intrigued now, I looked through more of them and my interest grew as I sorted them into separate piles on the table, which soon became too small to hold them all. I dumped the lot into the box, carried it into the living room and sorted the statements into piles for the different accounts on the dining table. But the piles got too big to deal with, so I picked out statements for the last four months for each account and put them in date order to have a closer look. In the end I had to get a pad and a pencil to keep track of what I began to see as a pattern. And an hour later I had a rough analysis of the way money moved through the accounts and I knew what I was looking at, though I had never seen it before – this was money laundering! The whole thing was very cleverly constructed. Some of the accounts had quite large cash deposits at irregular intervals and money was transferred to the other accounts, some for the same amount and on the same date each month but there were also random amounts moving between banks. I could trace payments in and out from one account to another and I had to admit that the illusion those movements created was brilliant. Most of the accounts received regular income and could have passed as someone’s only bank account; salary going in, expenses and bill payments going out, and occasional cheques. It was magnificent and mind-boggling. Nick must have had an extensive record keeping system to be able to juggle so many bank cards and create the ongoing debits for this number of accounts. But why would he do it instead of just spending cash? And how could he possible use so much money? I made a cup of coffee and drank it standing beside the table looking down at the piles of papers, trying to find a rational explanation. But there was no denying it – the total coming in, discounting the sums transferred between banks, was astounding. I did some mental arithmetic, extrapolated it to cover a year and decided that the money fed into the accounts must account to more than four hundred thousand dollars over a year, possibly more than half a million. I imagined Nick regularly going to different banks and different branches and using his many identities to deposit cash, which would then filter through in an orderly fashion into all those other accounts. It would require meticulous planning and recording to work well and it must have taken up a lot of time. Maybe this was what he did when he was at my place; maybe he spent his evenings working on this scheme when I thought he was watching TV? And what did he spend the money on? I had to admit I was baffled. It was not until I realised that there were online payments from all the accounts to one company that I figured it out and a quick internet search confirmed the theory: a sharebroker! Now I knew what he was doing; he filtered illegal cash through many accounts and invested considerable sums in shares, the perfect retirement fund. I tried to imagine how he had organised it; presumably he had multiple identities with the sharebroker, using the names on the bank accounts, which seemed logical, but how did he cope with the Inland Revenue department? He must have registered these imaginary people with the tax department somehow. It was hard to reconcile the cheerful young man who had been living in my flat with the clever criminal mind I had now discovered. While I ate my snack meal I tried to decide what I should do. Naturally I had to hand the bank statements over to the police, but I thought it would be safer not to mention money laundering, because I was reluctant to admit that I had been snooping and I did not want to make Benson even more suspicious. Keeping a low profile and not getting involved in any way seemed the safest option in case they took it into their heads that I was part of Nick’s activities. I would leave the bank statements sorted into their separate bank bundles, so that anyone looking at them would straight away see that there were many accounts from different banks and in different names. The natural conclusion would be that Nick had kept them sorted and it removed me from the equation so I sorted the older ones too and put them all back in the drawers. They were now in tidy piles with alternating bunches lying crossed, which meant that to fit them into a normal document box the person who took them out would need to turn them the same way round – another way of making sure that the many identities were obvious. I was getting ready for bed when I remembered the clothes I had dumped into the washing machine when I got dressed in a hurry after my shower and I decided to start the washing machine right away even though it was late. I checked the pockets before turning the washing machine on and felt something hard in the pocket of the jacket I had worn; it was the key that I had picked up from the sidewalk. I started the cold wash cycle and went to bed with a book until I could hang things up in the bathroom. When I was finally ready to call it quits for the day I noticed the key again on my bedside table. I sat on the edge of the bed and looked more closely at it, trying to imagine what it might fit: it was not like any key I had ever seen before. Compared to normal keys it seemed very flat and un-detailed and the end you hold on to was just a flat disc with the letter C on one side and 9 printed in blue on the other side. Was it Nick’s or had it already been on the footpath and he just happened to fall next to it? I put it on my bedside table and got into bed.